After 7 months of our confirmation and as we said yesterday, here is STC’s official announcement and pricing details for the iPhone 4 and iPhone 3GS 8GB. STC will begin selling the iPhone in Saudi Arabia Sunday February 13th, 2011. STC also sent an Arabic SMS to everyone who “registered” for the iPhone 4 saying that it’s available at their showrooms on a first come first served bases. Basically there was no reservation. FaceTime will not be available on these iPhones as far as we know. i would like to ask that extra classical package will be offered for every1 or for only for vipz az we have seen in da case of mobily they only offered to raqi……. You can get only Pre-paid or Basic package and all other packages are for Gold and Diamond customers. Hisaf, how can you become a Gold and Diamond customer? Please anyone tell the timings when STC will lanch iphone 4? i m coming to Jeddah for a short time so if anyone can tell the time i will be greatful. inaddition to that only one package is available which is 99 per month with the maximum advance. got the 32 GB one from olaya street…all outlets are running out of stock!!! Good for you guys you got your phones, here in Al khobar they just got our contact details and they said they will call us back again. no one can beat that joke since they already made us register online! From jeddah here. I went on 3 branches one in tahlia one in amir sultan and one in khalidiya. All except in amir sultan said its finished and I should try again tomorrow (monday). The on in sultan I went during prayer and the salesmen were outside smoking I asked one of them in english if they have it on stock they said its finised. And then i overheard him talking in arabic with a friend on a phone saying why you did not tell me earlier, yalla come and drop by here we have it. It seems the salesmen prioritize their friends and familes before us customers. btw only the basic package are available and only 32GB. @Saud what time did you go there? and why you need to wait 4 hours? I just got mine from STC . the number finished @ 9 AM. I was in AlTahliyah Sales Office and precessing was very slow ( I took number @ 8 AM and I got IPhone around 3 PM 🙁 ). I think you can wait for Iphone 5 if you are not hurry 🙂 . There is no facetime as mentioned by khaled, i am notÂ satisfiedÂ with the signal strength…. yesterday i went to sultana branch (in madinah) and the only thing everybody was asked to do was write their name and phone number and that they would call later on…i was no. 23…no calls..no problem..today again i went early and heard to my amazement alyaum waraqah jadheedh..i wrote my name and phone number….and sure i am no. 2…but before i left i asked another guy there what time they would call..he said you would be called after yesterdays’ people..then i asked how many they did call he said 10…i am sure something is going wrong…stc management shouldn’t let their staff or employees play with customers like that..
Did they tell you what types of subscription plans are available for postpaid (If so, what are the requirements)? And if there will be any units for prepaid? the guy there said that all postpaid plans are available but did not mention any requirements..and said there would be units for prepaid but didn’t say after how many weeks…but another guy told me that i should already have a postpaid…i don’t know if they made up this rule, so they could give it to those they want..their relatives..its all corruption.. I went today STC Sales Outlet near HARA, Riyadh. Only postpaid was available. I took the waiting number for postpaid connection. and when my number came and asked for BASIC postpaid plan then he asked for my existing mobile number which is prepaid of STC. then he told that he can issue any iphone to existing postpaid customer…. ITS A MIND BLOWING SERVICE OF GOVT COMPANY ie STC…. Yesterday, i visited Tahliya Branch not Main Branch at 9pm. First time he denied to give token but when i asked to Senior Executive then he told to give me. My turn came at 9:30pm and when i reached there then he asked whether i am a existing STC pospaid customer then i said no. after that he told to come tomorrow because system was slow but he issued to another SAUDI guy…. When i visited today, he told me that iPhone is out of Stock….. I think they are doing partiality…..
if STC administrative is reading then please try to take positive response…. I hope +ve response from STC//…. Are they selling only to expatriates or not? because wherever i go they say its finished. i think mobily was doing better. Do they mean it’s for the existing postpaid customers only, and that you cannot create new postpaid account just for the iPhone 4? If not, then why don’t you make a new postpaid account?? Reading the thread… i noted that STC is no diffierent with Mobily in regards to holding iPhone inventories. had the same dilemma of rushing to various mobily branches last time, and frustration of waiting for long queu only to know that NO MORE stocks! i have bought for an extra 500SR. The rush will subside in due time…by then perhaps you can grab a unit…the problem is…what if the stocks are no longer available. Well hello iphone 5 or.. hello HTC or Samsung!!! I already talked to my brother in the UK and told him to buy it for me thru apple UK website which costs 3100 WITH FACETIME and he will send it to a friend coming here in jeddah! I tried extra and jarir before that and they are awaiting stocks so much better option for me is, thru my brother. If we are from the UK we only wait 3 days. And more convenient online with free delivery, here in KSA its like a stone age system…. FaceTime is not a big deal my friend. It’s in itself is an incomplete technology yet. Alternatively Skype app provides the same feature with no diversified requirements. @MIMalik Facetime is one of the main features of iphone 4 without it you just have an iphone 3gs, all the other apps that offer video call, is good but if someone calls you via facetime you need to tell them to open other apps instead, facetime is built in, and its a good option when calling someone, you cannot set skype or tango or YM to answer facetime calls right? Its not just expats I went to all STC outlets on the 13th and yesterday and along with me I encountered saudi’s also inquiring if it is available, like me they we’re quickly told to try again tommorow and that they are sorry its finished for the day! So, as you can see its all about knowing the right ppl from STC or being a relative of one. I dont know if there will be more stocks in the coming weeks. Any news saudimac??? I checked in Ghadeer branch and got one with potpaid plan after 30 minutes. I took it home activated via iTunes. Then made the first call and to m y surpize the earpiece was not working. I could hear the person on other side via Speaker Phone only. After googling this, I found it that i’m not alone who faced this problem. Next day I took the phone back to the same branch, They have refused to refund the whole thing and have asked to wait for 3/4 days for repair or replacement. I’m not interrested to get back a REPAIRED phone and I have made it clear to them. Let us see how this turns out. By the way, I have found STC is much better than Mobily. Do you guys know that Mobily still seels iPhone4 if you have friends there or bribe them 3,200 SAR? I checked in Ghadeer branch and got one with postpaid plan after 30 minutes. I took it home and activated via iTunes. Then made the first call and to m y surpize the earpiece was not working. I could hear the person on other side via Speaker Phone only. On googling this, I found it that i’m not alone who faced this problem. Next day I took the phone back to the same branch, They have refused to refund the whole thing and have asked to wait for 3/4 days for repair or replacement. I’m not interrested to get back a REPAIRED phone and I have made it clear to them. Let us see how this turns out. By the way, I have found STC is much better than Mobily. 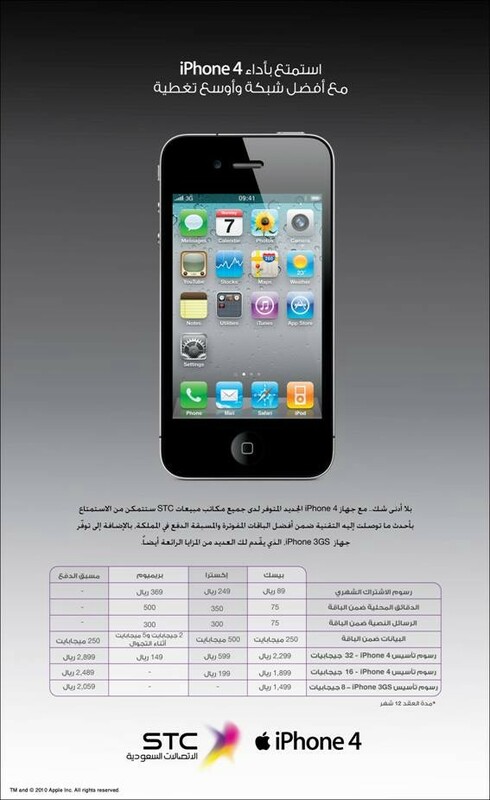 Do you guys know that Mobily still sells iPhone4 if you have friends there or bribe them 3,200 SAR? Sorry for double posting. The browser got stuck while posting in the first shot. Can u plzz tell me where isÂ Ghadeer branch??? i am in Malaz so i will come by King Fahad Road… Please let me know..
HOM916 where did u get it from in jeddah? was it today? and did they ask cash or do they need a credit card only payment? Can someone tell me how do they deal with the old SIM card? Do they allow you to transfer the same number to the new micro SIM, or do they just hand out the new SIM card and that’s it (like in case of Mobily). They offer to get the package on the old number. Out of stock in all the branches in riyadh? is the phone from stc unlocked? STC should not spoil their name and the cutomer trust. I’m so excited when I saw STC offering of IPHONE 4 for affordable price however while I’m reading all of your comments, I was upset bcoz they are not doing there jobs and make the customer waiting and fooling. I hope STC will take action on this problem. I hope I can have 1 iphone also in your company. how we can check balance in STC pospaid sim ?????? sir,i just want to ask if the iphone 4 will work in the philippines? Yes kabayan, it will work with globe phils. Just buy a globe micro sim or normal 3g sim and cut it to micro size. Update your carrier settings and it will work in no time….